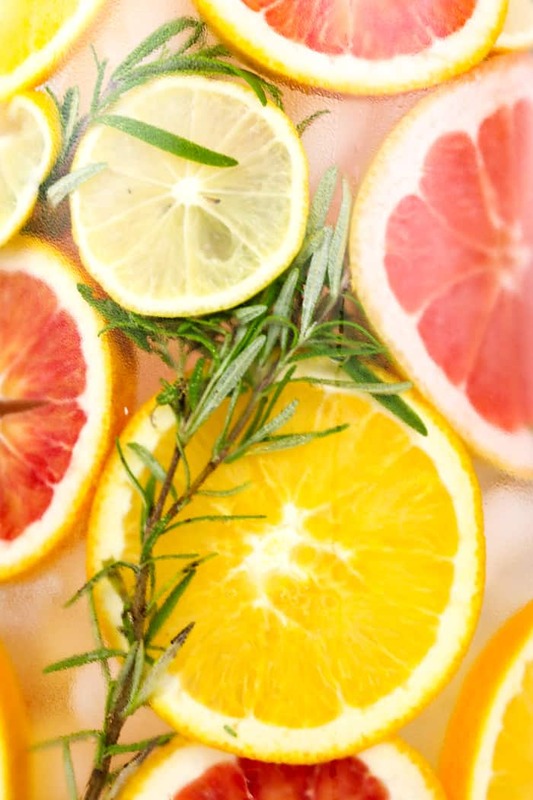 Brighten up your day with a batch of Winter Citrus Spa Water. 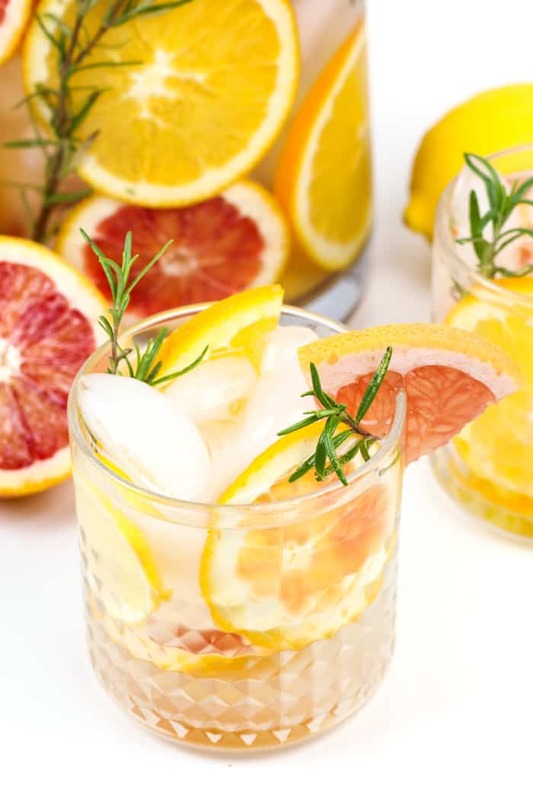 With four kinds of citrus and sprigs of fresh rosemary, this water is both a beautiful centerpiece for a party and the most colorful way to increase your daily H2O intake. Citrus is arguably the best thing about winter produce. Forget beets and sweet potatoes (I’d like to). Blood oranges, grapefruits, kumquats and lemons are where it’s at. My excitement over my latest citrus haul inspired this Winter Citrus Spa Water. This is a recipe I have made three times now and have been dying to share with you. 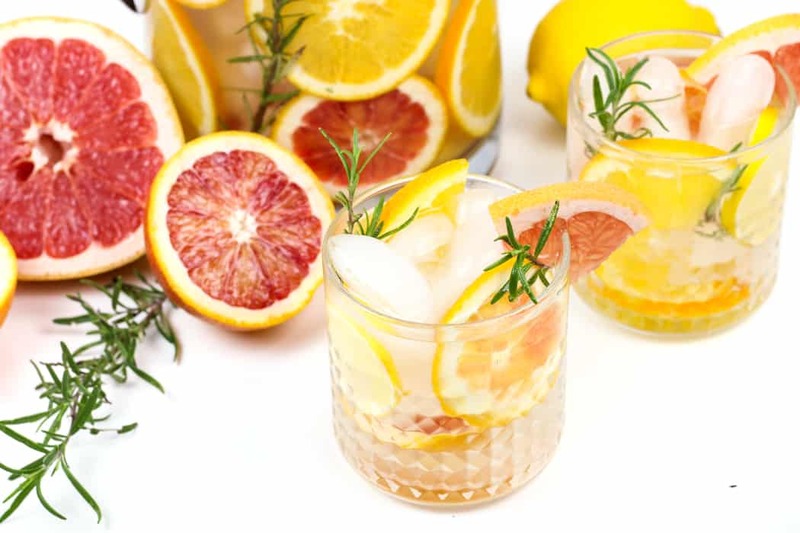 With sprigs of fresh rosemary and four kinds of citrus fruit — grapefruit, navel orange, blood orange and meyer lemon — it’s a little tart, a little herby and incredibly refreshing. This spa water is also inspired by the fact that I’m trying to be smart and taking in more water every day. I bought an Ulla device last year to help me with this. The Ulla is a reminder device that you attach to your glass or water bottle, and it reminds you with a blink of a light to take a sip every once in a while. It’s motion sensitive and only “wakes up” when you’re near it. This is absolutely not sponsored — my Ulla just happens to be one of my favorite things! It’s amazing how seamless it feels to drink more water! 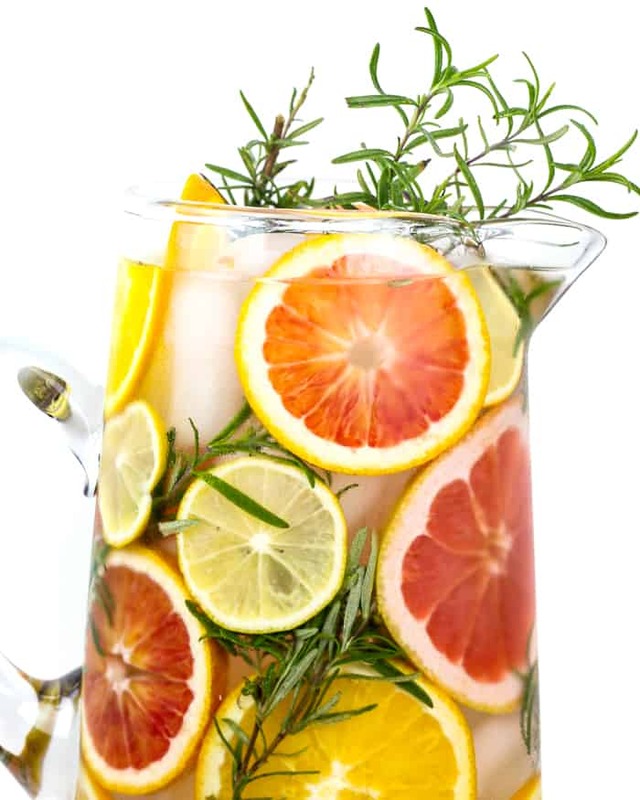 Spa water is awesome because you can infuse water in your fridge with whatever fruits and herbs you have on hand. Strawberry Basil Spa Water is so delicious in the summertime, and I can’t wait to make it again when it warms up. It generally keeps for 1-2 days. The longer it infuses, the stronger it will taste. 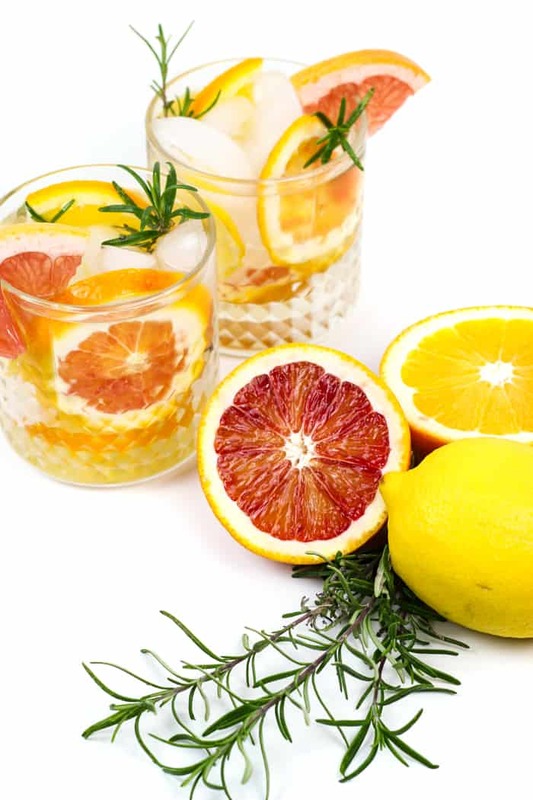 That’s especially true with citrus — the zest and pith bring a bitterness that you might not love on Day 2. Just a warning. The other thing about spa water is that it’s fabulous for parties. 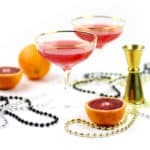 Most people enjoy a glass or two of water at a party, especially if they are drinking alcohol as well, and spa water can be such a nice way to cater to the non-drinkers as well. 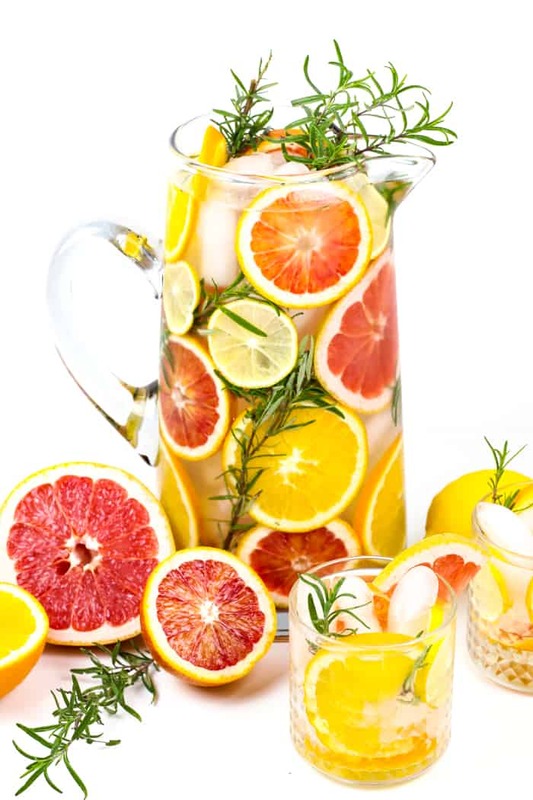 If you pretty up a pitcher (I have this one) with tons of fruits, herbs and ice, it is guaranteed to make a statement on your beverage table. 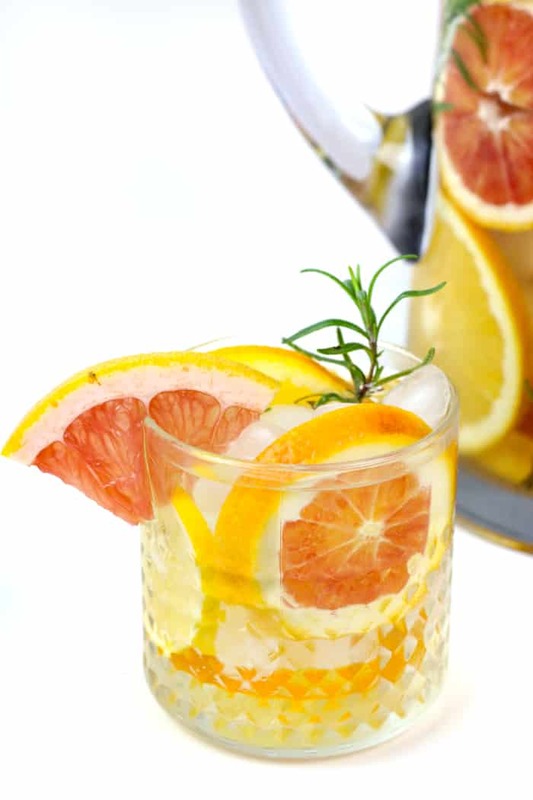 In fact, I served this Winter Citrus Spa Water at a gathering earlier this week, and everyone talked about it. I can’t take all the credit, though — those colorful citrus just draw in the eye! 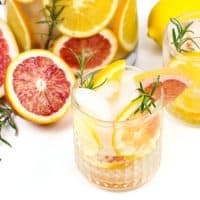 To make mine, I put a handful of ice cubes into the bottom of the pitcher and pushed the slices of citrus and the rosemary sprigs around it. The ice works to hold the slices in place. Then I added more ice and more citrus, in sections as I worked my way up to the top. You can do this with any shape pitcher really! Then, add water. 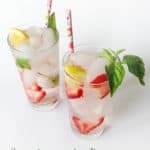 You can make spa water ahead of your party, but since the presentation of this recipe is so reliant on the ice, I make this one right before so the ice doesn’t have too much time to melt. You can prep all the sliced citrus and wash & dry your rosemary ahead of time, though. 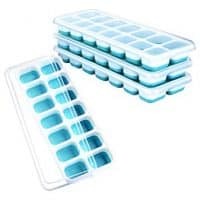 Then arrange with the ice, add water, and you’re good to go. Or, you can skip the arrangement and just throw everything into a pitcher and add water. It’ll still be so pretty and so delicious. When the water runs out? Just add more. 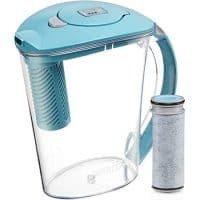 I keep my Brita pitcher full of filtered water so I can just dump in more. Spa water is typically served at hotels and spas as a fancier alternative to plain water. But really, it is just water infused with fresh fruits and herbs to give it a bit of flavor. You can make it with pretty much any fruit or fresh herb you have on hand — be creative! 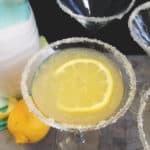 What citrus can I use? Whatever you want! I used grapefruit, meyer lemon, navel orange and blood orange. You could also use tangerines, clementines, limes or kumquats. How long does spa water keep? Spa water tends to keep for around 1-2 days. You can refresh spa water during that time by adding more water. The longer it sits, the more flavorful it will get. 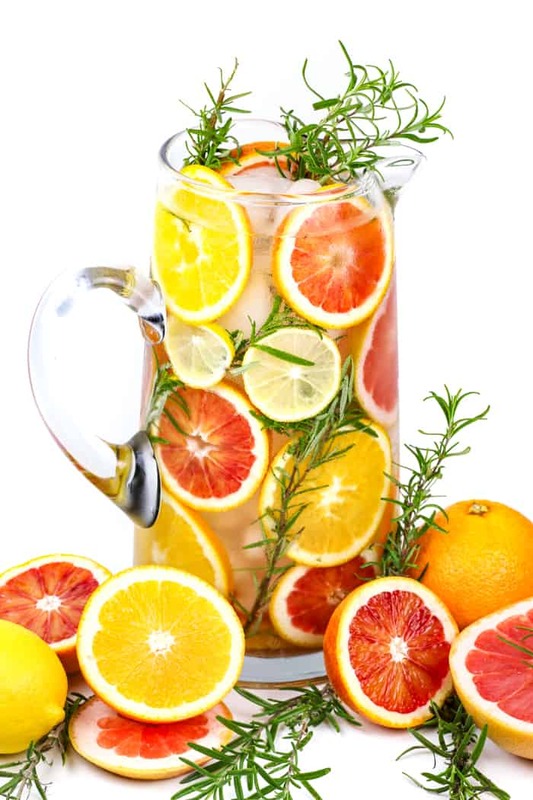 If using citrus, note that it can turn bitter thanks to the pith and zest of the fruit. 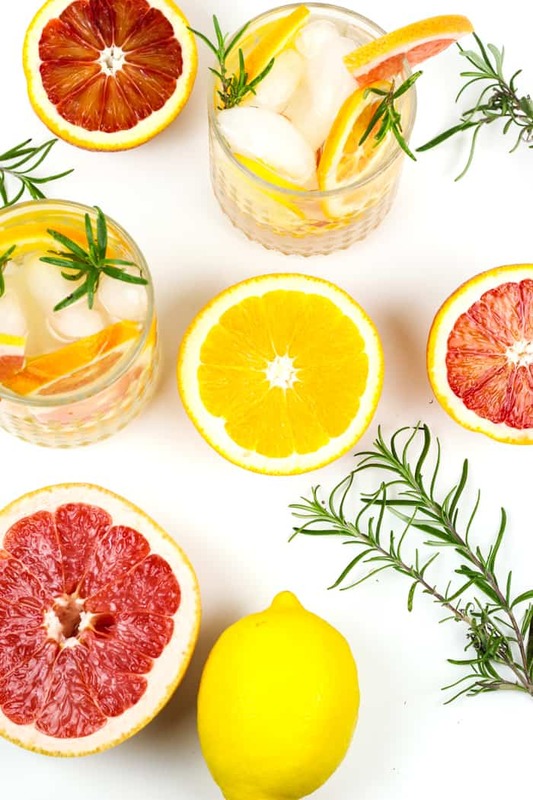 If you’re feeling fancy or want to make an impression at your next party, this Winter Citrus Spa Water is totally for you. Wash and dry all citrus and rosemary sprigs. Layer 1 cup ice in the bottom of a pitcher. 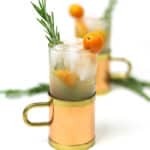 Arrange varying slices and rosemary sprigs around the ice, pressing the slices against the glass. Add another cup ice and arrange more fruit and rosemary. 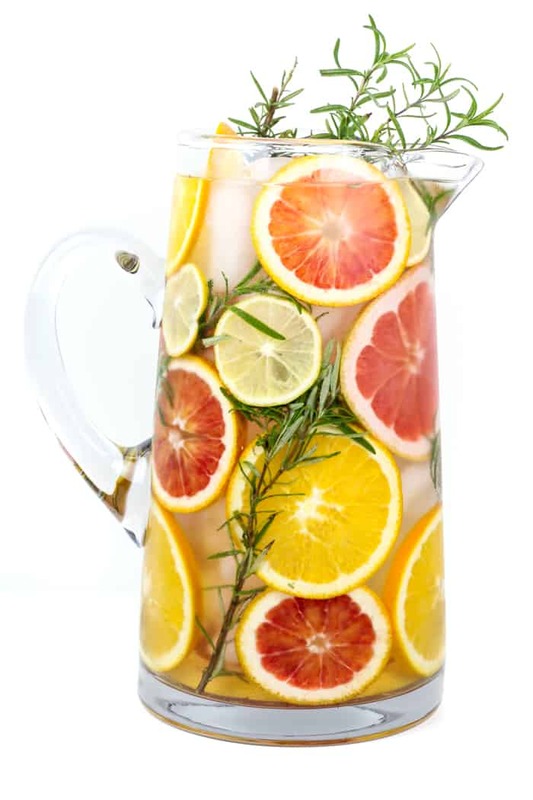 Repeat until the pitcher is filled with citrus slices and rosemary. Fill pitcher with water. 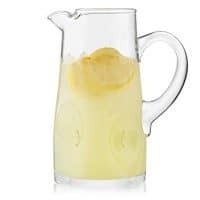 Store in a pitcher for up to 2 days.